In 1979, Kim Thuy and her family fled Vietnam on a boat, landing in Malaysia, and eventually coming to Canada as refugees. They settled in Quebec, using a meagre government stipend to buy furniture and warm clothes. Kim Thuy embraced her new home and language, and grew up to become an entrepreneur, a world traveler, a mother, and, finally, a writer. In Ru, she fictionalizes her own life story, crafting the incidents and memories of the immigrant experience into a series of vignettes that are as much reminiscent of poetry as prose. Ru is composed of a series of very short chapters loosely ordered and strung together. Nguyen An Tinh, the fictionalized protagonist, recounts her own childhood, but also jumps ahead, thinking about her children, particularly her autistic son. Flowing and loosely connected, the stories are striking if not particularly coherent. Kim Thuy sometimes uses mirroring language, starting the next story with the same phrase that concluded the last, or picks up on an idea that was only briefly touched on in the previous vignette. The structure is a form of free association, mimicking the wandering of the mind through the past, but always connecting back to the present. The narrative is extremely personal, and offers little exposition or historical context for the conflict that drives An Tinh and her family from their home. The immigrant narrative Kim Thuy recounts feels candid despite being fictionalized, but not unusual. There is hardship in the journey, but also a lot of hope. It is Ru’s form that really draws attention to it. It is a liminal work that straddles the border between fiction and non-fiction, poetry and prose, novel and interconnected short stories. Kim Thuy’s language, as translated by Sheila Fischman, is clear and strikingly observant, even when the topic is a filthy pit toilet in a Malaysian refugee camp. The images are fleeting, but leave a powerful emotional impression. 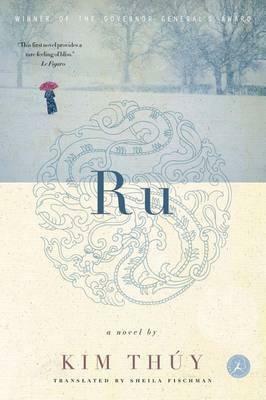 Throughout the week of Canada Reads debates, Ru stood out as the most beautifully written book among the contenders, which included Intolerable by Kamal Al-Solaylee, The Inconvenient Indian by Thomas King, And the Birds Rained Down by Jocelyne Saucier, and When Everything Feels like the Movies by Raziel Reid. The challenge this book had to overcome was the fleeting nature of its structure, and the difficulty of feeling a strong connection to the protagonist. Craig Kielburger argued early on that it wasn’t successful at achieving this year’s theme of breaking barriers because the challenges in Ru seemed to melt away in its quickly shifting structure, but by the end of the week he was strongly advocating for Ru’s ability to promote compassion. This change reflected a shift that seemed to have pulled all the other panelists along as well. Although Martha Wainwright made a powerful statement that she wanted to live in the kind of Canada that could read When Everything feels like the Movies without raising a hue and cry, she voted with the rest of the panelists—except for defender Elaine Lui—to eliminate When Everything Feels like the Movies in the final round of debates. Although a popular book and the winner of many awards, Ru was a surprise winner given Cameron Bailey’s quiet though articulate defense in light of the more passionate arguments of Elaine Lui and Martha Wainwright. Congratulations to Cameron Bailey and Kim Thuy on Ru’s victory. You can watch the Canada Reads debates on the CBC website.